The scent you may smell will not remind you of any known flower, nor of anything else existing known to you. Then open your eyes and read that page ‘with an open heart’. Often through those words you will clearly get His answer. “A part of the Light, just as you are. Always perceive Me this way by your side, feel how we can fuse together this way, as if I could become part of you, as if you could become part of Me. In truth, a part of Me can come inside of you. “… More than anything, there will be a profound friendship and a profound union with Me, I will be your source of strength, enthusiasm, and joy. Do not be surprised I mentioned friendship because together with our union, in its deepest, most intense, sacred meaning, it is the expression of the relationship that is necessary between Me and you. This friendship, this fusion, will allow you to perceive Me so much more and completely until you will see Me. To perceive Me and feel Me so intensely can be extremely big and encompass so many different sensations that you may not feel the need to see Me, though it will happen. Come with Me, so close to Me, and in the silence of your heart perceive Me, recognize Me. So then, create your own space, as often as you can, in your home, with a candle light within the privacy of a closed room, in the silence, or in the Great Home (in Nature), with the light of the sun, or the stars. Create this intimacy, stay within the silence, and ask Me to vibrate intensely for you. “Do compare yourself with Me, as friends do, solely as a friend who loves you in your totality, that loves you intensely, and infinitely. And the heart will be fulfilled. I cannot tell you that your daily life will be easy, though together we can make it simpler, more pleasant, happy, and make your journey lighter. “There is the Light that awaits you, an immense Light, and the kind of Love that envelops you. It is coming back Home, where there is only a smile and nothing more, the kind of peace you cannot comprehend right now, the kind of pleasure you are not able to perceive now. It is coming back Home simply to smile, live within peace and delightfulness, though these words do not express what truly peace and delight are. It is coming back Home where everything is Love, Light, and joy. It is a long walk which will take us back Home, and when a Soul gets lost in the darkness, it is not able to return home, but it is wrapped in the shadow until it will be ready again for a new journey to continue its walk towards the Light. It is the shadow, the absence of Light, which creates the suffering. This is why we are by your side, so that you may always experience the sunlight during your journey, and find it again at your destination. How can I hear Your voice? “…Anything can happen for it is such a natural process to hear Our voice. There has been a time when there was such a deep connection between us, there was a lot of purity in your heart, and a lot of respect for the Universe. It will flow naturally, however, My child, do not remain trapped in anxiety because that attitude tends to distance you from achieving it. Do not fixate your gaze in the effort to see Me, and do not remain in the constant tension of wanting to hear Me. Keep your heart open, stay within that serene, delightful silence, which you know. Stay within the simplicity of who you are, within the Love you possess, and most of all, within the integrity of Being. Direct your life towards the Light, and everything will become simple. Remember that the ability to hear Us, as you say, does not require great knowledge, but rather great hearts; it does not require great techniques, but rather a great life cleansing, and integrity. Many things can help but these are the basic requirements. Always keep in mind that a child has not read books, acquired knowledge from great masters, he does not possess great techniques nor has he attended any school, yet children talk to Us, play with Us, and Our voices are very natural to them. “… You know you possess ancient capacities. When the ‘Hearts’ used to live in contact with the Universe and surrender to It, this was a common ability. As soon as the mind had found ample spaces, this natural ability got lost. You all have this ability still, however, it is not known if you will express it in this life. It requires a great effort to surrender, great perseverance, and great courage. For this, many schools have been created, but speak very little about total surrender, and great courage. I can tell you that there is a lot of confusion on this aspect, and very little attention to the act of cleansing in these schools. Within you there is tidiness. I would like to ask You to make me feel Your presence a lot more. “I will make My presence known to you even more, however, keep in mind that it is much easier for you to see Us and hear Us when there is serenity in your heart and peace in your Soul, because in that state you are more open to certain vibrations, to perceiving what is Beyond, while when you are in pain, your vision is blurred, and your perceptions are impaired and limited. That is why in those moments, among one another, you should ask to receive and give embraces, Love, expressions of Love, tenderness, sweetness, because your body needs that contact that you still have a hard time feeling when it comes from Us. Your Being limits that perception, a natural limitation to the experience you live right now, and that you have chosen to live. Imagine for a brief moment, to find yourself before the sea, in a vast prairie, peaceful, at peace, fulfilled, feeling everything so intensely, seeing everything so much more beautiful, perceiving all the details of the scents around you, whereas when you are aggrieved, you are sad, troubled, you are not as open to notice the beauty around you, the scents are not perceived the same way, the vibrations and the images of those places are not as accessible. How will I know that you are by my side supporting me? “Simply call on Me, not only once, but in every moment of your life, and without fear nor limits. Ask Me anything, ask Me simple things as well, even those things you call ‘material’. We do not make any distinction, they are all part of life. Ask Me for little help, or big ones, ask Me to protect you. Should you choose to walk a luminous Journey, ask Me to help you with that by creating circumstances, situations, and encounters. You allow Me to be by your side, therefore: call on Me, ask Me, and extend your hand towards Me. You will begin to see both big and small signs of My presence. And if you wish, you will also feel my presence near you. Remember We manifest our presence in a thousand things. It could be a scent, a whisper, a breeze, a warm wind, all of this can stir you towards feeling My presence; it is a whisper of the heart, it is the word coming from another ‘Heart’, it is the page of a random open book, all of these things can confirm to you My presence, and My help. We bring to you what you need in a thousand different ways so that you may re-establish a profound connection with Us, and right then you will speak to Us simply, and see Us naturally. What can I do to feel You more during times of solitude? “Talk to Me and then listen to what happens in your heart. Then take action because action is what truly helps. Do not allow your mind to make things difficult, rather allow your heart to feel how intense and beautiful this moment is, when you will have opened that door, then so much could happen, and so much more We can help you manifest and bring to you. Express your everything, and the day when you will dance and sing with joy will not be far, then you will express your everything within the Love and the Light. When you come with help, or with Light, think of giving Love and Light to small children so that when you receive Love and help, you will feel like a small child. This way all the Love, the Light, and the help will flow abundantly, and there will be no negative feelings to prevent receiving help or to dampen the great heat of Love. Angels, is it you, those forms of Light I sometimes see in my room? “We can say We are there. But We are not the only ones, because you are for Us the Soul to love, to protect, to help grow, but you are also a part of Us that can allow Us to act in many hearts. We have already made ourselves known to you and We will always make Ourselves known, but there is with Us a world of Light. But am I able to see you? “Seeing Us requires an open heart, a child’s heart, not capabilities. It requires a union, not learning. Will I see you also during the day? Will I be able to see you as a manifestation of colours as it has already happened? What if I won’t see You? “Growth requires faith as well, to believe brings these kind of gifts, as it has already brought you some, however, remember to merge with Us for this will allow you to profoundly feel us within yourself to the point you will no longer be concerned about seeing or hearing us or not. To perceive Us will become then a natural process. I would like to thank You for all the support you are giving me, but mostly for the great Love You always have for me. Thank You. “You will feel this great Love of Mine always more because your heart will be increasingly free and healed. And when you don’t see My help, or you will not see or hear My help, then smile, knowing that that situation is in itself a great help, and I will help you through it, for you know Our intense help, our all-encompassing protection, cannot deprive you of those pre-chosen experiences, those lessons you chose, but it is right then and there we come with our most substantial help. You will then notice that as you give more room to your inner child, you will always more feel like singing airily, though the learning continues, and when you are within your inner child space, you will feel My Love more, and it will feel always more fulfilling. Remember and remind everyone else that We are profoundly in love with you all, so that everyone may truly fall in love with Us so deeply, as to lift their feet from the ground. I love You, too, so much. “Very sweetly, I invite you to love Me even more intensely. When you feel this profound Love for Me, then you will look for me continuously, so that as I rise towards the Sky, your gaze as you look for Me, will stay in the Sky as well. When you love Me so intensely, your heart will feel My immense Love and it will look for Me even more. At that point it will merge with My heart to receive everything that will fulfil it entirely. That way, it will rejoice and stay open to the Love I wish to instil in it: a new kind of Love. When you love Me as much as I love you, nothing else will be more significant to you, for you to me are more important than anything. This is how the Soul will be free to fly towards the Love, the Light, and within the Love and the Light. Everything will be more simple, joyful, fulfilling when you fall in love with Me. Do not fear this kind of falling in love. I place you before anything else because my task with you is what is most important. When you place Me before anything else, the Great Light, you will feel that the Soul’s destiny, the Soul’s purpose, is more important than anything else, and you will live that with great joy. When you listen to your heart, you will feel My Love intensely, you will perceive My presence and will be in unison with Me because I am not an image, rather I am real. I am not asking you to fall in love with something abstract, like an image, or a thought, I am asking you to fall in love with the reality that exists, that one can sense with their body. Then you will be in love with Love itself, you will become Love. Each of your steps will be a joyous one, which will take you towards Love, towards the Light. It is just like when you are going towards a loved one: that step doesn’t cost you any effort, on the contrary, you do not even realize you are taking it because your gaze is right there on your loved one. That’s how each action becomes joy, because you do it for the loved one. Feel all of this as Love’s help, as Love’s gift because I wish to take you along a path of joy, of Love, so that your face may be radiant, so that your heart may know no longer any heaviness, sadness, suffering, so that the body may not know any more fatigue. This can happen, it can happen now. You will get a taste of My Love’s elation that I will help you reach. It is very beautiful to merge with You and feel Your Love. How can I avoid forgetting about You, when in my daily life I go through so many situations, sometimes difficult ones, that are distracting me from You? “This can never happen when you stay open to receive My Love. It is like listening to some sweet music and a voice continues to whisper to you: “You are love, you are loved, you are loved”. The heart then rejoices and cannot be distracted by other voices or events, not even for a moment, because the heart is present, within the Love, and listens to the Love only. I can, though, suggest to you a way to remind you that I am always by your side. You can create something that is clearly visible and that you would keep with you always, that reminds you of My Love in each moment: under the Sun, under the rain, in the Light, in the dark, within the joy, through difficulties, when you are afraid, when you take happy steps, when you tremble, in your daily life, and during unforeseen events. When you look at this symbol, you will feel your Soul connect to the Light, your heart connect with My Love and hear these words of Mine: “I love you, I love you deeply, I love you”. This whisper will give you the kind of strength you never knew before, a push, a certainty, a reassurance. You will feel enveloped within My Love, which protects you from anything, which creates everything, and which fears nothing. My Angel, give me great strength. “Give Me great freedom to act as to make you completely free; surrender always more so that I may act and take you on my lap. Never doubt, never, the immense Love I feel for you, the immense Love the Great Light has for you. Be certain of my constant help, when you ask Me, when you allow Me. Be certain of My protection, of the Great Light’s protection as well. Beloved Luminous Soul, in the beginning it is not easy to feel your Angel as a friend that loves us of an infinite Love, that takes our hand, and so tenderly takes us along our path in every moment of our life. This usually happens when we do not see it, we do not feel Its presence because our mind creates difficulties, obstacles and suggests to us that our Angel doesn’t really exist, that it is the fruit of our imagination, of our illusions, that it is our unconscious talking to us, the Higher Self, or the inner Teacher. Maybe we have been taught to have an attitude of ‘sacredness’ that does not allow us to relate with our Angel as if it were a friend. The same has happened to me, too, but luckily my Angel, with infinite patience, has helped me overcome this difficulty and has taught me to talk to him like children do when they talk to anybody with the same simplicity. It was then easy for me to feel that He was really my ‘special Friend’, who loves me as I am, who is only asking me to love him in return, hold his hand to help him with the task of taking me along my Path. When I forgot about His presence, he smiled to me. When I didn’t give him my hand because I was distracted by sadness and sorrow, He kept smiling. It was His unconditional Love, his constant understanding, his total compassion, his beautiful sweetness, his immense tenderness, his infinite patience that made me fall in love with Him. As I fell in love with Him, I fell in love with Love itself, with the Light, and everything turned into magic. Now I never let go of His hand, I hold on to Him uninterruptedly. Fear not, do not be sad when it seems like your Angel is far away, more than ever in that moment He is carrying you, he is by your side, he is waiting that you go back to Him. Sadness, suffering, despair, illusions, distance us from Them but never Them from us. Your Angel will always be there, with open arms, waiting for your return, to reassure you when you are afraid of something, to make you feel His Love even more when you realize you made a mistake, when you realize you have not acted as a luminous Soul. He does not judge you, He does not reprimand you, and with Love He helps you understand those mistakes, the falls, the omissions, and all that can cause a sense of guilt. These are experiences, lessons that always teach us something and that teach us the same level of compassion for others as well without judgement, His same unconditional Love. With Him by your side, you can learn to have towards yourself and others the same kind of compassion He has with you, the understanding He has for you, His immense Love, His total lack of judgement, His infinite patience. You will forget what guilt is all about, you will then accept everyone as they know they are Divine Sparks, Luminous Souls, Children of the Light. You will see everything as an expression of the Light and you will love in a new way everything, everyone, including yourself. 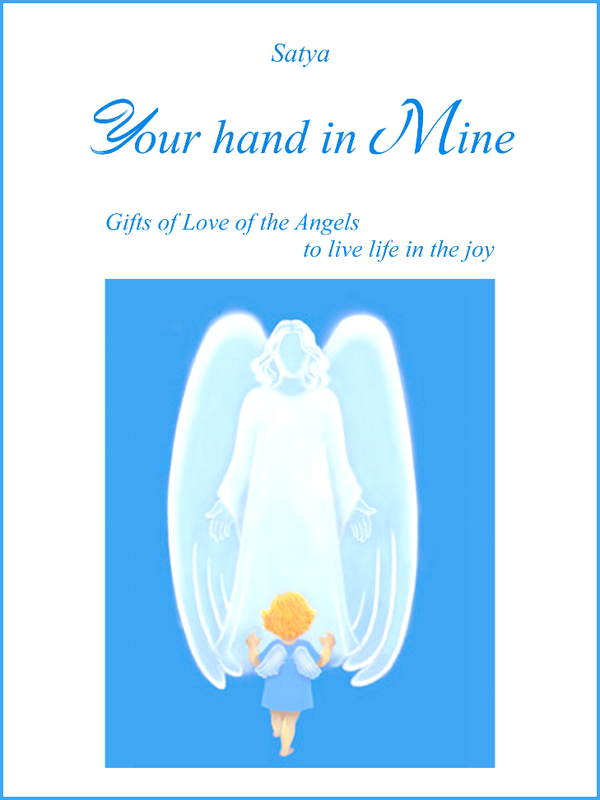 This is the Love of the Angels, the new kind of Love Angels are teaching us, the kind of Love we can dispense around us. Sweet Luminous Soul, answer lovingly to all your mind’s doubts, telling it your Angel does exist, that you now choose to be guided, accompanied by Him. Ask your mind to take some distance as to allow your heart to feel your Angel, and to your Soul’s eyes to see Him. With the simplicity of children, talk to your Angel as if it were your best friend, the kind of friend that can give you all that a father, a mother, a real friend can give you. In Him you can find shelter, the softness, the tenderness and the tact of a mother; you can find the protection, the strength, the security of a father; you can find the devotion of a real friend when, whatever you do or say, he only sees you as a Luminous Soul. Your Angel will teach you the Wisdom of the Light, of Love, so you will then love everything and everyone, you will be happy to walk with whoever wishes to walk with you towards the Light, the Love, though you will need no one, nothing. This is the kind of magic you will know of with your Angel: you will love everyone, you will love everything, for the love of loving, helping, giving, making people near you happy, as well as those you will meet along the way, however, you will not need these people, and the absence of that need will allow you to love unconditionally. To love without conditions is to love someone as he is in that moment, independently of his Creed, his thoughts, his doing, where he is at any given moment, whatever choices he makes. When this person will have walked by your side long enough, and has received everything he wished to receive, you will know how to let him be free to continue his journey, walk on his path, live his life, reach his destination without regrets, painful detachments, there will only be Love all along. As you fall in love with your Angel, you will be in love with Life, you will be in love with the Light, with Love, you will love for the pleasure of loving, you will give for the pleasure of giving, without expectations, without pretence, you will love yourself in a fair way. You will feel that the only thing that truly matters in life is to love, to give, not receiving and being loved in return…this way to receive and to be loved in return will be natural consequences of giving, of loving. You will live within the Light and for the Light, you will live within the Love and for Love.